I must have been half sleepy when I was suddenly jolted to a wake by the commotion in my train compartment. As I opened my eyes and looked around trying to gauge what the noise was all about, I saw more than half of the people sticking their heads out of the window. 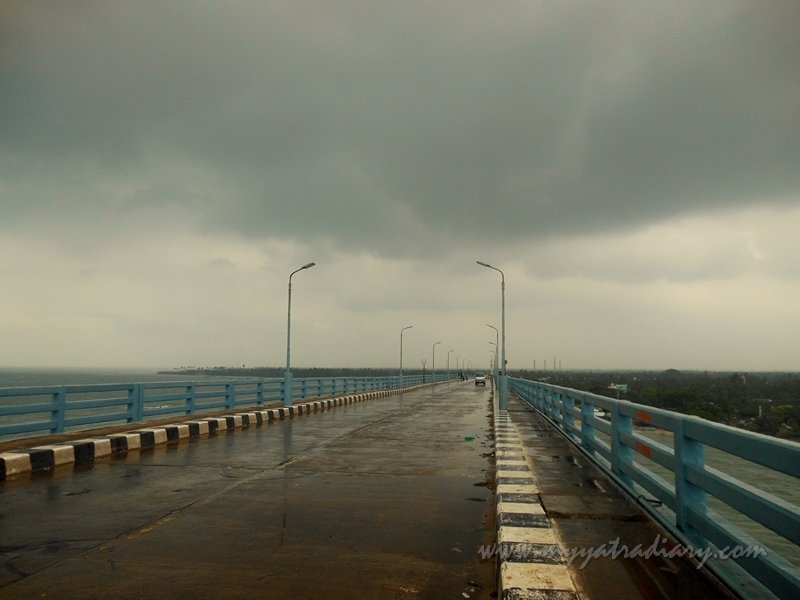 My dad meanwhile, in all his boyish excitement, was trying his best to draw my attention – Look, Pamban Bridge! I immediately craned my neck towards the window and gazed in awe outside. Like a beaming lady immaculately groomed in blue, she looked tremendously powerful waving gracefully and welcoming us all in, in her comforting appearance. 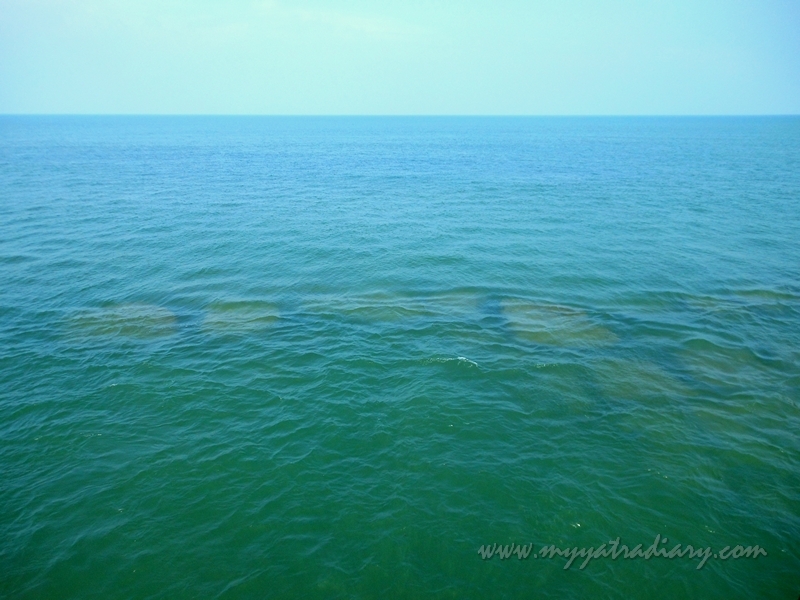 the experience of travelling over the Rameshwaram sea. Yes, it is that close! I rushed towards the door, camera in hand, my brother tugging along, in the hope of catching a better glimpse. To our happy surprise, we found the entire door to ourselves for all the time spanning the length of India's first sea bridge and only second in length after Bandra-Worli sea link in Mumbai. 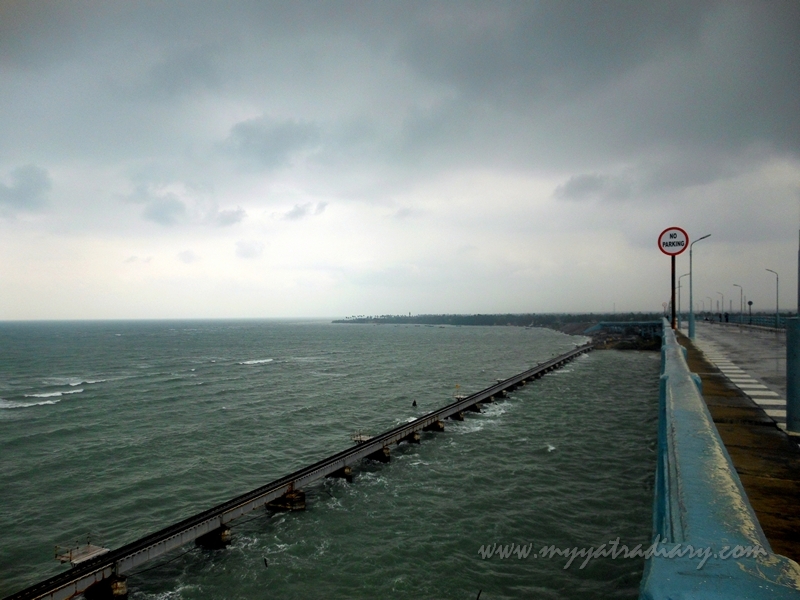 This is how she looked from the Pamban Railway bridge. 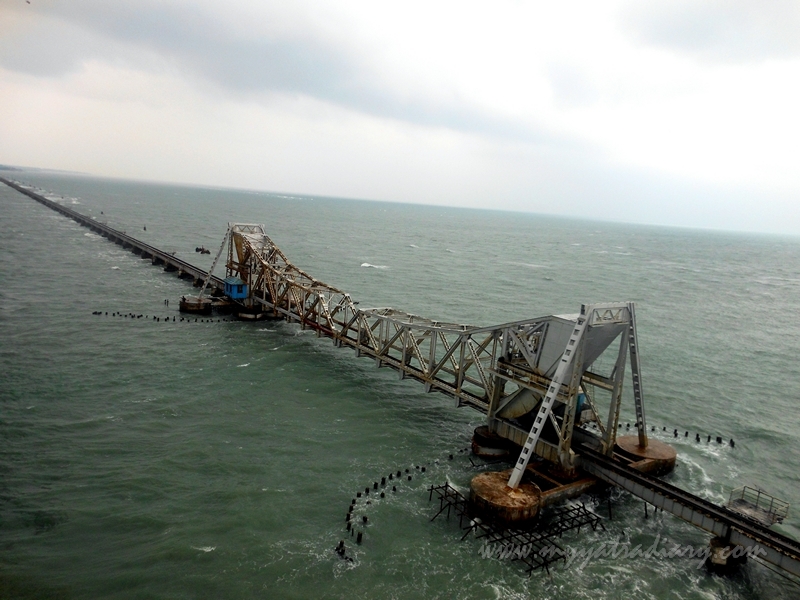 We stood there, thrilled to have experiencing a travel on the Pamban railway bridge - an architectural marvel, a historic wonder - up close and personal, in sheer silence as if complimenting the serene beauty of the waters expanding beyond our view towards the horizons, enthusiastically admiring the shimmering riches from the concrete mass held closely in its lap by the deep blue sea. 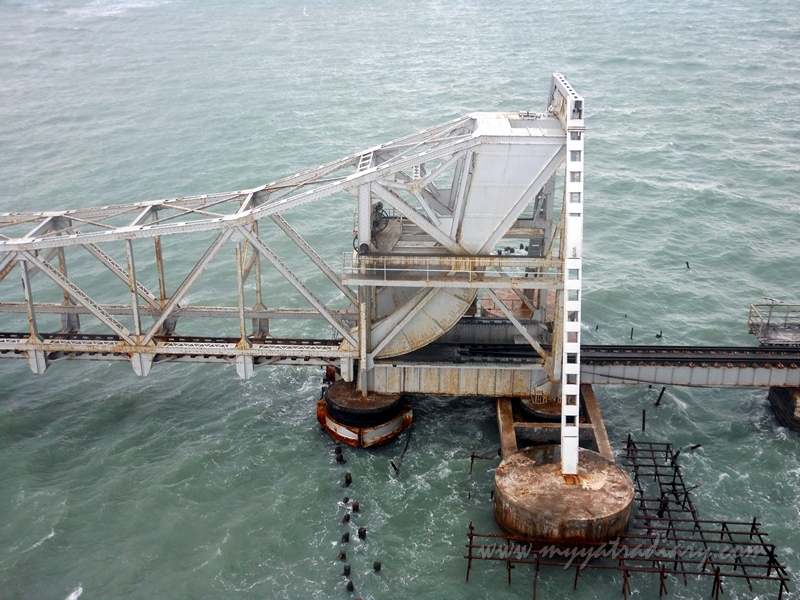 The 2.06 km long cantilever bridge on the Palk Strait was thrown open to traffic in 1914 and despite suffering a setback for the first time in December 1964, when a severe cyclonic storm hit this part of the area is still going strong, providing the much needed rail connectivity to the pilgrim centre of Rameshwaram. 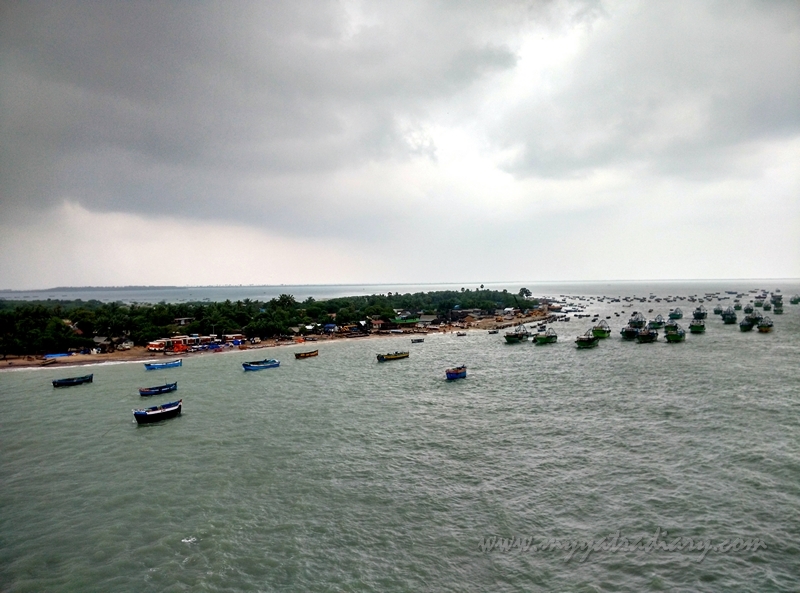 On the trail of exploring the town of Rameshwaram, we revisited our feelings of awe and wonder once again, this time by stepping foot on its relatively modern counterpart – the road bridge which was opened way later in 1988. It was terribly cloudy that day but the rain Gods showed mercy so that we could enjoy a rain free viewing experience! Here are a few snaps captured that day from the road bridge captioned with fun facts related to this iconic bridge. though primarily it means the latter. until 1988 when this road bridge, running parallel to it on a higher level, was built. Earlier, it used to transport hundreds of pilgrims everyday to the temple in the island. of the bridge that opens up to allow ferry movement. On an average, 10 to 15 boats and small ships pass beneath the bridge every month. which can be raised to let ships and barges pass through. next to Miami, US, making the construction a challenging job. The location is also a cyclone-prone high wind velocity zone. 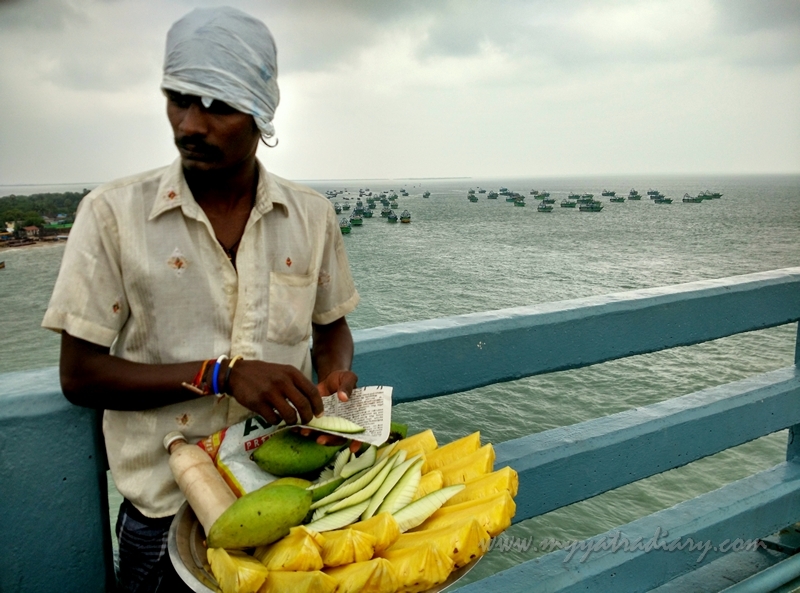 And here's the traveller tip: While you are at the Pamban bridge - all excited catching a glimpse of the Pamban Railway bridge and the views beyond, don't forget to buy some guavas from this man - the experience couldn't have been complete without this delightful bite! I almost stood there on the door of the train and experienced the magnificent sight! The water looks so mesmerising! :) thank you Arti for this virtual tour! 1914 Wow, never knew this bridge was more than 100 years old.. truly iconic and the images sure are awe inspiring. 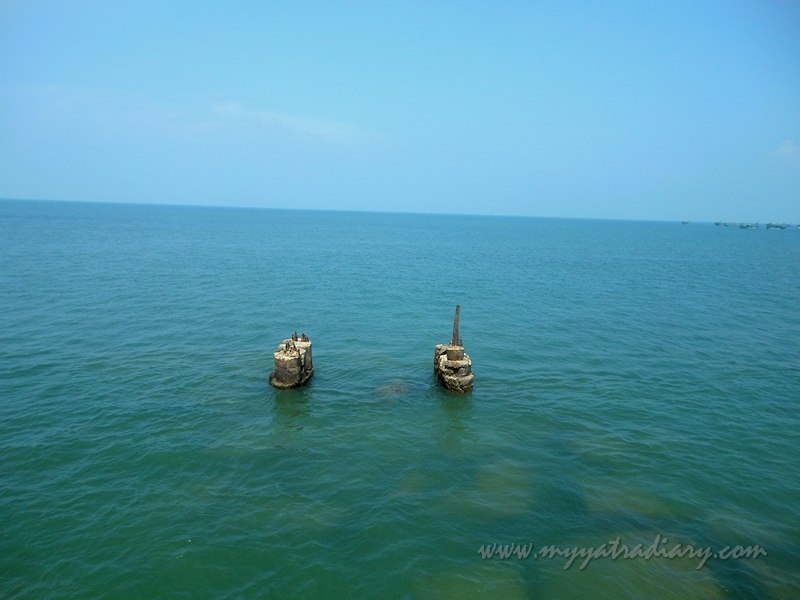 I must visit Rameshwaram soon. Architectural marvel of INDIAN railways.. Lived in the pics while reading your words, Arti! God is the greatest artist. The beauty of nature is so marvelous. Great that you capture it so beautifully. The sight is amazing and the structure is truly iconic.Happy Pongal, Arti! Amazing shots of an amazing place! Loved this post.. the first pic was breathtaking! Great views from the bridge. Super narration...loved the way you started the post and the pictures as usual are aweeeesommmee!! Amazing.. Loved this post.. We were also very much excited when we visited Pamban last year.. thanks for making us re-live those moments ..
First of all, the shots are superb. the short descriptions with the shots had made this post very lively. Lovely pictures.. Arti :) My parents being in Railways have actually taken that small maintainence coach that goes in that narrow railway bridge.. and have stopped when the ferry went by and continued again :) :) I still envy them for not taking me with them.. May be some day! I manage to take some pics of bridge while on train and it was entering the bridge though it was a bit scary. Happy to have read this, for the bridge would provide convenience to the travelers like us (and the public in general) and also because of the challenges of the environment there. Your dad did a good job of waking you up...better not to regret later!